#4 was showing off her new branding to the press in the UK today. 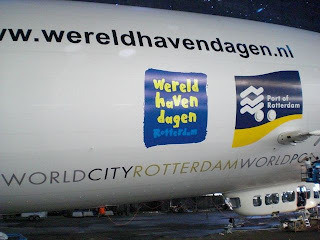 Here are a few pictures that were taken on Sunday while the decals were being finished. 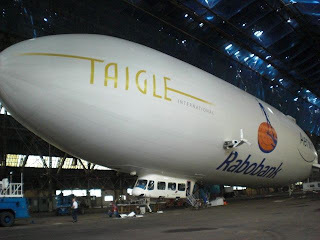 The brands are Rabobank, Aerwin Technologies (who are arranging the tours), the Port of Rotterdam, with their Wereld Haven Dagen (World Harbor Festival) that the airship will be attending on the 5-7 September in Rotterdam, and Taigle International. 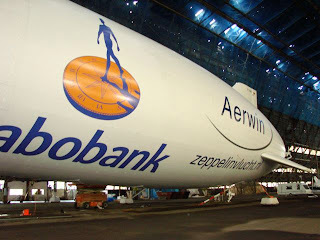 Its well worth a visit to the latter website as they have a cute Zeppelin animation on their homepage! Aw, she looks so beautiful in her new clothes.